A great card for using up little pieces of card! Sale-A-Bration is drawing to a close so I thought it was about time that I used this stamp! I wasn't sure what colours to use so I turned to the Botanical Gardens paper for inspiration and grabbed my Many Marvellous Markers to ink the stamp in Mint Macaron, Hello Honey and Cajun Craze. I cut some flowers in the same colours with the Botanical Builder framelits and one of the ferns from the same set in Mossy Meadow. I used black candy dots as flower centres and layered everything on to Cajun Craze and Mint Macaron card. I added in a couple of yellow candy dots for good measure! 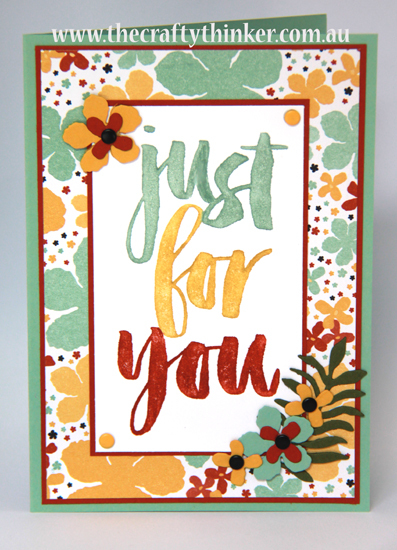 Such an easy but bright and cheerful card. If you've had your eye on any of the wonderful free Sale-A-Bration items now is the time to act as they won't be available beyond 31st March.